Once in awhile you run across a book that can change the course of your life, and “Start Here” certainly has the ability to do just that. 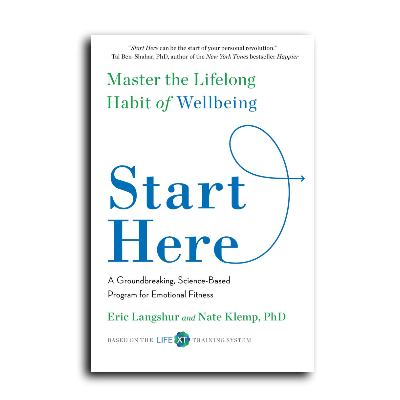 I recently had the honor of interviewing Nate Klemp, PhD the co-author of a new book entitled “Start Here” and we had a lively discussion about the book and the practices that are incorporated into the book and hopefully become part of the readers daily routine. We start our interview off by discussing the “happiness set point”, yes we all have one and we have the opportunity to re-set our happiness set point as Nate explains in our interview. The key to resetting our set point is understanding the three set point forces. The first one is “judgement” and is the mind’s tendency to divide the inner and outer world into categories–good/bad, right/wrong, like/dislike. The second one is “attachement“. Is it the mind’s tendency to approach or cling to pleasurable thoughts, beliefs, or sensations. And the third is “resistance“. This is the mind’s tendency to fight or flee from painful sensations, experiences, or situations. These three set point forces can certainly be monitored, managed and can have an amazing effect on your level of happiness. The foundation of well being revolves around three stages, train, be and do. These three stages make up the foundation of the Life-XT program that is outlined in “Start Here”. The training stage consists of meditation, movement and inquiry. The “Be” stage consists of presence, gratitude and compassion; and the “Do” stage consists of engagement, relationship, and contribution. While these words don’t do justice to explaining the entire Life-XT program it does provide you with the elements included in the program. If you want to learn more please click here to be directed to the website for Life-XT. You can also click here to be directed to the Facebook page for the book.